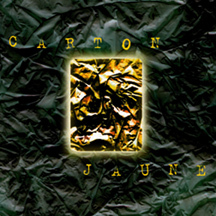 Carton Jaune means "Yellow Card", and it was the name of the group that was formed for the summer campaign of 1999. It's also the name of the CD that was made, and the title song. There are eight songs on the album, four in french by me, and four in english by Durand Robinson, a friend and colleague of mine. I've also included some song MP3 audio clips in Quicktime format. To make them play, just click on the "Play" triangle in the controller bar under each title. Carton Jaune et le nom du groupe qui était formé pour la campagne d'été de 1999. C'est aussi le nom du CD qui était produit, et le "tube" du CD. Il y a huit chants sur l'album, quatre en francais qui sont les miens, et quatre en englais par Durand Robinson, un ami et colleague. Avec les textes, il y a aussi des clips audios MP3 au format Quicktime.. Cliquer sur le triangle "lecture" dans le barre qui se trouve sous chaque titre. this thing that Im striving for? and what if I find that there's nowhere to go? en un autre voie ? Et si ce que je cherche etait la ? And what if what Im searching is there? Qui conduit vers je ne sais quoi ? Until there's nothing left of it. I don't want to finish like that. I'll keep it, I'm certain of that. Si c'est Dieu qui m'a fait ou veut-il me conduire? Si le hasard décide a quoi sert de lutter? Quelle est la vérité, quelqu'un peut-il me dire? Si je dois croire au Ciel ou bien désesperer? If it's God that made me where does he want to lead me? If luck decides whats the point of trying? if I need to believe in heaven or just be hopeless.